Three 25mm miniatures: male & female thief, bard. Set of 7 polyhedral dice (d4, d6, d8, 1-digit d10, 2-digit d10, d12, d20). 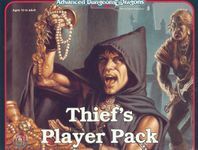 You've found the ideal all-in-one playing aid for your favorite game with the AD&D Game Thief's Player Pack. Inside your Player Pack is the information you need to play your chosen class of character - the thief - with skill and finesse, and a gathering of playing aids selected by TSR game designers as the items both experienced and beginning gamers find most useful.